Take full advantage of the tropical waters around St. Maarten during this 4-hour sailing excursion. Jump in for some snorkeling in Long Bay with the provided gear, relax on deck, go swimming, or sip mimosas and munch on snacks. Breakfast included. Show up at the Simpson Bay Resort in time for 9am check in; the boat will depart at 10am. 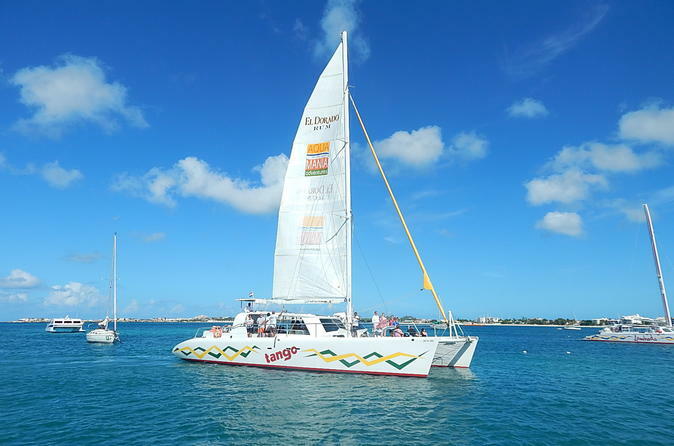 Step aboard the 'Tango', a fully equipped catamaran, and set sail up the coast of St. Maarten. Relax on the deck or in the boat's nets or take the opportunity to snap photos of the tropical coastline. You're headed for Long Bay, where you'll drop anchor for a swim or a snorkel. A breakfast of croissants, coffee, and tea is provided. Once the boat drops anchor, dive in to explore the calm waters and check out some of the native marine life. For total relaxation, grab a mimosa and a flotation device and just zen out. Back on the boat, sip some rum punch or a Bloody Mary accompanied by deli sandwiches, fruits, and cookies. Return to your original departure point around 2pm.